If you have been quilting for any length of time you may have some of those “Pillow” pannels in your stash. So why not turn them into a lap quilt? So I had 6 blocks. Now the hunt was on to find cordinating ( I was once told that the use of “matching” is a faux pas int the quilt world) fabrics. Voila I found one meter of 5 coordinating prints purchased from a Facebook destash site. What to do? well if I cut these into strips and add them to the blocks then add some borders it should give me a nice size single quilt After much thought and playing I came up this quilt. Then the hard part came was to write up a pattern for it. This is the very 1st pattern that I drafted up. This actualy went alot smother than I had anticipated. I ended up calling this pattern “Cascading Blocks” The pattern can be purchased from my Craftsy Store at http://www.craftsy.com/user/2395143/pattern-store?_ct=fqjjuhd-ijehu&_ctp=202590,2395143 or by contacting me directly. 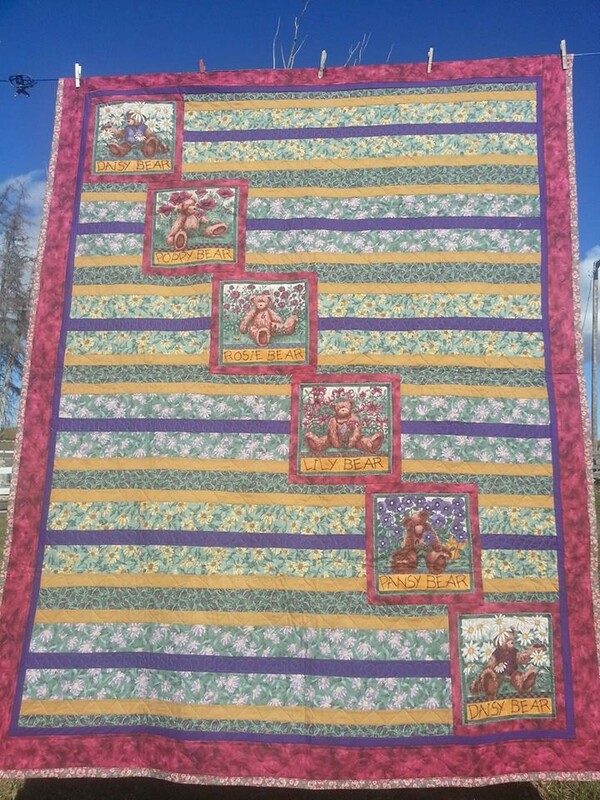 The nice thing about this pattern is that the panel blocks can be switched out for the same size pieced block. Next Canadian Unity Project 2015.